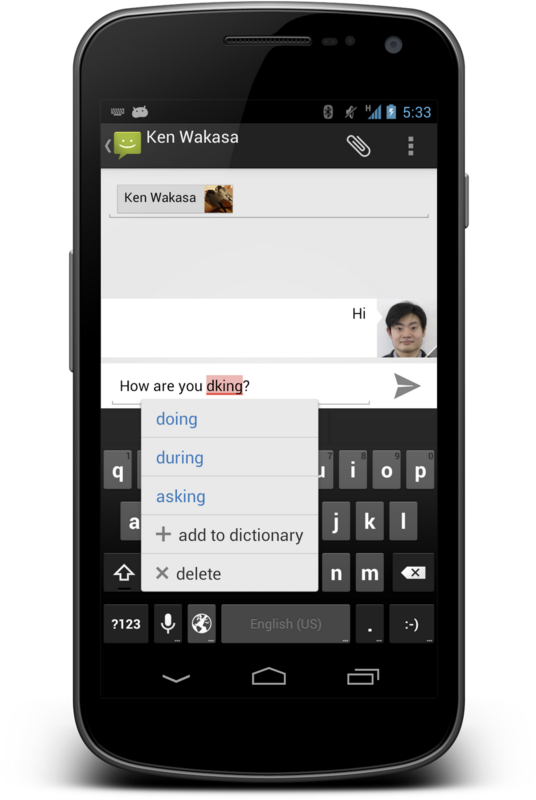 The Spelling Checker framework improves the text-input experience on Android by helping the user quickly identify and correct spelling errors. When an app uses the spelling checker framework, the user can see a red underline beneath misspelled or unrecognized words so that the user can correct mistakes instantly by choosing a suggestion from a dropdown list. If you are an input method editor (IME) developer, the Spelling Checker framework gives you a great way to provide an even better experience for your users. You can add your own spelling checker service to your IME to provide consistent spelling error corrections from your own custom dictionary. Your spelling checker can recognize and suggest corrections for the vocabularies that are most important to your users, and if your language is not supported by the built-in spelling checker, you can provide a spelling checker for that language. The Spelling Checker APIs let you create your own spelling checker service with minimal steps. The framework manages the interaction between your spelling checker service and a text input field. In this post we’ll give you an overview of how to implement a spelling checker service. For details, take a look at the Spelling Checker Framework API Guide. To create a spelling checker service, the first step is to create a spelling checker service class that extends android.service.textservice.SpellCheckerService. For a working example of a spelling checker, you may want to take a look at the SampleSpellCheckerService class in the SpellChecker sample app, available from the Samples download package in the Android SDK. Note that the input argument textInfo of onGetSuggestions(TextInfo, int) contains a single word. The method returns suggestions for that word as a SuggestionsInfo object. The implementation of this method can access your custom dictionary and any utility classes for extracting and ranking suggestions. For sentence-level checking, you can also implement onGetSuggestionsMultiple(), which accepts an array of TextInfo. Notice that the service must request the permission android.permission.BIND_TEXT_SERVICE to ensure that only the system binds to the service. element of the spelling checker declaration in the manifest file. In the example below, the metadata file spellchecker.xml specifies the settings Activity as SpellCheckerSettingsActivity and includes subtypes to define the locales that the spelling checker can handle. That’s it! Your spelling checker service is now available to client applications such as your IME. For faster, more accurate spell-checking, Android 4.1 (Jelly Bean) introduces APIs that let clients pass multiple sentences to your spelling checker at once. To support sentence-level checking for multiple sentences in a single call, just override and implement the method onGetSentenceSuggestionsMultiple(), as shown below. In this case, textInfo is an array of TextInfo, each of which holds a sentence. The method returns lengths and offsets of suggestions for each sentence as a SentenceSuggestionsInfo object. Spelling Checker Framework API Guide — a developer guide covering the Spelling Checker API for clients and services. SampleSpellCheckerService sample app — helps you get started with your spelling checker service. You can find the app at /samples/android-15/SpellChecker/SampleSpellCheckerService in the Samples download. HelloSpellChecker sample app — a basic app that uses a spelling checker. You can find the app at /samples/android-15/SpellChecker/HelloSpellChecker in the Samples download. To learn how to download sample apps for the Android SDK, see Samples.